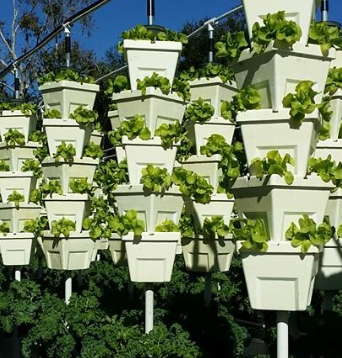 Green Towers are vertical gardens made from safe food-grade EPS containers stacked upon a pole structure, which can be made from metal, wood, bamboo or other locally sourced materials. The use of EPS containers retains moisture and nutrients while also maintaining consistent soil temperatures. In optimal climate conditions, these properties can lead to water savings of 85%, and fertilizer savings of 50%. Up to 30 containers may be stacked vertically, making Green Towers a viable option for users with limited land available. The low costs of EPS containers and the tower framing materials make Green Towers a cost-effective alternative to other prefabricated vertical gardening systems.